While Food & Friends relies on the support of thousands of volunteers each year, we also create special partnerships with local service organizations. One of those amazing organizations is the Washington AIDS Partnership (WAP), which sends one of its Health Corps members each year to work with our Client Services team, assisting with First Day Deliveries, our annual holiday toy drive, and numerous other tasks. 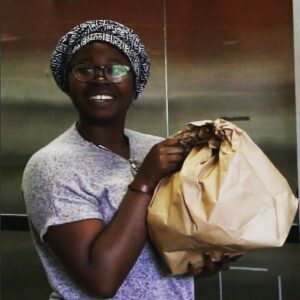 To learn more, we spoke with Julie Goldstein, Program Associate at WAP and Lola Adebiyi, a WAP Health Corp member who worked at Food & Friends this past year. What is the mission of Washington AIDS Partnership Health Corps? 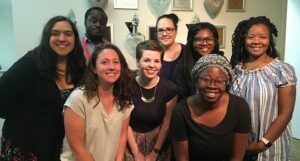 Julie: The Washington AIDS Partnership (WAP) recruits, trains, and mentors a team of 12 young people who serve at Washington, DC health care and community-based service providers, such as Food & Friends. Each individual is a critical resource for the community, and expands capacity in important ways. Thousands of people are reached by the team each year, with health education, HIV testing and counseling, access to health care, hospice, and other health services. The members of the Health Corps program provide life-saving services to clients, and increase organizational capacity in a very real way by providing 12 committed young people who want to make a difference at their host agencies. How many years have you partnered with Food & Friends? Julie: Food & Friends has been a host agency site since the program’s inception, and our 22nd team starts in August! Why have you chosen to partner with Food & Friends over the years? Julie: Food & Friends offers their Health Corps member hands-on public health experience and mentorship in an organized, well-run, and supportive work environment. Members at Food & Friends work directly with clients, delivering meals and conducting home visits. Members over the years have always had phenomenal experiences at Food & Friends, and WAP has thoroughly enjoyed the partnership and relationships formed. What do the Health Corps team members gain from their service experiences? Julie: Members grow immensely through a year of service. They receive mentorship and professional development from their host agency supervisors and colleagues, as well as from WAP staff. At the end of their 11-month service year, members are more engaged in the public health field, and have accumulated invaluable public health experience and skills. Members go on to be leaders in the medical, public health, education, and legal fields. Lola, how did you first become involved with WAP? Lola: I first became involved through working as a 2016- 2017 fellow with their Health Corps, a program that allows recent graduates to serve in DC for year in the area of HIV/AIDS public health. Lola: I’ve most enjoyed the emphasis on community and teamwork. I feel comfortable going to my supervisors and peers about any issues knowing that I have the support that I need to be able to serve in my best capacity. What is one thing that you’ve learned working at Food & Friends? Lola: I’ve learned more about the intricacies of food needs related to different types of illnesses and I’ve seen how food can truly have a medicinal effect. What are you plans for after WAP? Lola: I’ll be heading back home to Pittsburgh to attend the University Of Pittsburgh School Of Medicine. I’ll definitely use what I’ve learned through WAP to study medicine with a patient-focused, community engaged, and socially aware lens. How will you remember your time at Food & Friends? Lola: It has been an honor to serve DC in such a unique and unforgettable capacity! I’ve learned so many life lessons through amazing connections at WAP and Food & Friends that I’ll hold dear to me as I move forward. If you’d like to learn more about Washington AIDS Partnership, contact WAP Program Associate Julie Goldstein at goldstein@washingtongrantmakers.org.